Home / Interior Design / Before & After: Upholstered Chair! 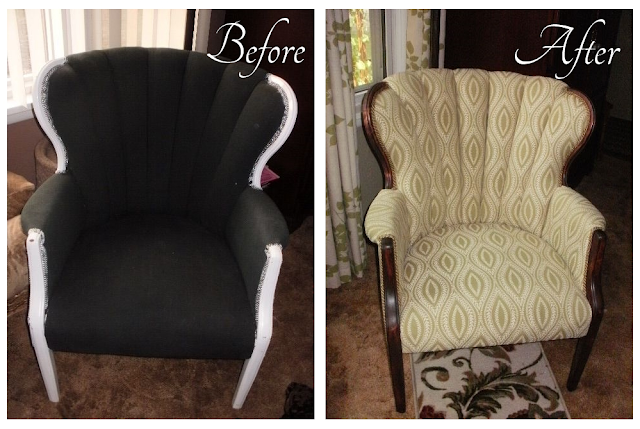 Before & After: Upholstered Chair! My mother gave this chair to me several years ago when I moved into my old apartment. I fell in love with the chair immediately. It had good bones, a beautiful shape, and it was heavy, an excellent candidate for being reupholstered. But…and this is a big BUT…it was ugly! The fabric was old and worn. The fabric covering it was a funky shade of green that I think might have been popular in the 1970s. I hated the green fabric on it so much that I don’t have any before pictures of it without something draped across it hide the fabric! After spray painting the fabric black and painting the legs white. Even though Jim never saw my chair when it was green, it still wasn’t beautiful, and I know he had to wonder why I was so adamant about keeping my ugly chair, because it didn’t go with anything. I get it. I really do. It was hard to imagine that my ugly duckling chair was really a beautiful swan waiting to emerge. Especially when its fabric has holes in it, has been spray painted, feels a bit like sandpaper and grabs pet fur like crazy. But I could imagine it, so I couldn’t abandon it. When decided I wanted to get fabric for it, I think Jim still had his doubts, but he went with me. I told you about it in my “I was shocked!” post from my old blog, because Jim surprised me when he chose a beautiful brown damask. It was the first step. I had fabric, all I had to do then was find someone to upholster it! That was back in 2011 and since finding an upholsterer wasn’t as easy as I thought it would be, I did other things to it to make it look pretty, including stenciling it. The stencil made a huge difference, but trust me, it looks better in the picture than it did in real life. 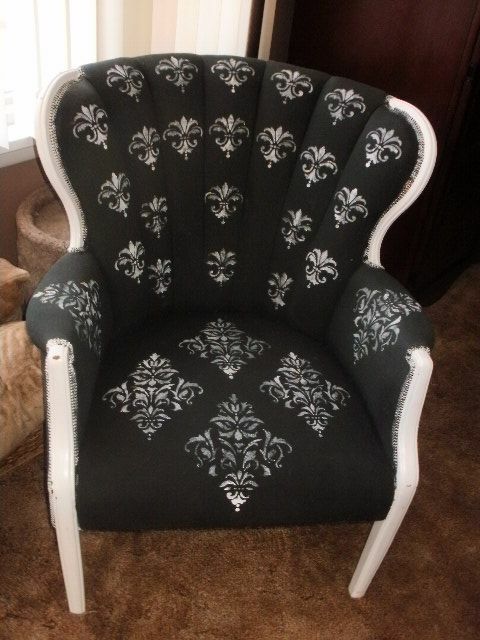 I was actually surprised and flattered by how many people pinned my chair to Pinterest after it had been stenciled. A couple years passed, and upholstering my chair went on the back burner. Then last month when shopping with my friend Karla, we stumbled upon an upholsterer in an antique shop who I just knew I could trust. I talked to her in person and saw her work first hand. I was impressed. I liked Marsha, and when I showed her a picture of my chair on my phone, she quoted me a fantastic price to upholster it. Upholstering the chair was no longer on the back burner! I was so excited I rushed home and pulled out the fabric we had bought two years ago. That’s when I realized the beautiful fabric Jim had picked out wouldn’t work. We didn’t have the same furniture, we had repainted the living room, and the decor was much more light and casual. I still loved the fabric, but it was too formal and the wrong color. I knew I had to get different fabric. I can’t even tell you how many fabric samples I brought home. It took some time, but I found the perfect fabric and trim. I also stripped and refinished all the wood, restoring it to a beautiful mahogany finish, which took longer than it should have because of some snafus with the stain. But I got it done, and then I took it to Marsha to upholster. She worked fast. A week later, my chair was done! Are you ready for the reveal????? Well, take a look! The fabric was reversible, so I had Marsha do the channel back, arms and seat with the dark background, and the back and sides in the light background. It isn’t terribly noticeable, but I think the subtle contrast elevates it to a higher level. 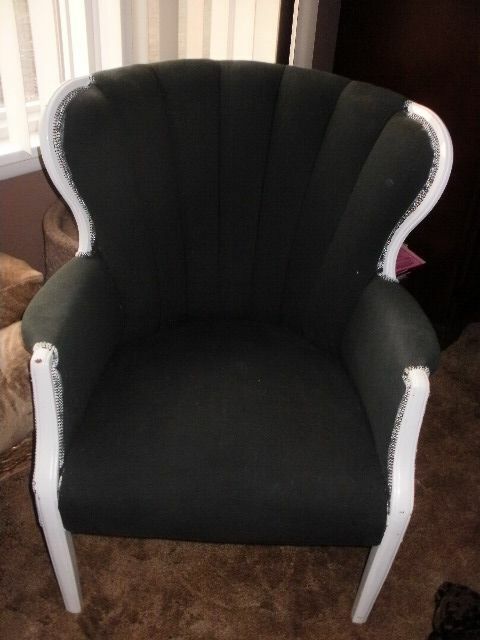 Side view of the newly upholstered chair. I love the way it looks with our new curtains. And I’m so glad I went with a lighter color. The color of the fabric and the color of the trim just pulls all the colors in the room together. This chair has become a statement piece–something special. In the room, and looking wonderful! My ugly duckling chair has become a swan and I love it! Oh…and Jim said it looks nice–which means he really does like it. Everything just fell into place, and I’m so glad I waited to find the right person!